Who suffers more pain, the one who remembers or the one who forgets? Tasha loves her grandfather, and she knows that PaPa loves her. But lately, PaPa has begun to forget things. He’s often confused and upset. Sometimes, he doesn’t even recognize his own family. And this hurts Tasha badly. How could PaPa forget her? 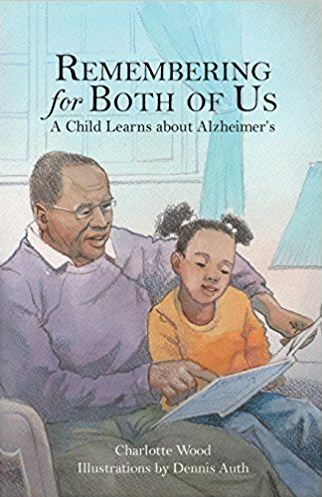 “Remembering for Both of Us: A Child Learns about Alzheimer’s” is a color- illustrated children’s book retelling a touching story of a child’s first glimpse of Alzheimer’s and a reminder that ties of the heart transcend age and illness. The book is based on the author’s personal family experience of living with the impact of her dear husband’s almost 12 years of the devastating illness of Alzheimer’s. It is a moving story about the love of a little girl for his grandfather and how the grandmother helps her see that while PaPa is changing, his love for Tasha has not. A lot has been written about Alzheimer’s – what causes it, when it occurs, how it affects the patient’s behavior, how it quickly turns a loving man into someone who can barely recognize his own family – and a lot more. But have we heard about the family who had to wake up every day to someone who may or may not recognize them? Do we know how hard it is to be living with someone who thinks of you as a stranger? How do we look at someone we love and tell ourselves that it’s better to walk away than see him losing it all to Alzheimer’s? Really, who suffers more pain, the one who remembers or the one who forgets? This book is a reminder that the mind might forget but never the heart and that no illness could ever erase one’s love even if memories start to fade. And that when all else fail – love won’t.